Discussion in 'Mac Basics and Help' started by adamcarvell, Jan 20, 2015.
hi i i am new to mac only recently as last week recieving a mac mini im not sure if i set it up right as it asks for a password to delete stuff and to move files from folder to folder is this normal behaviour ? im the administrator not the guest when signed. when set it up for the first time if i remember correctly i was asked if i would like a password to be set at login so i said yes ?. Yep.... sounds like you have it correctly setup and that is totally normal. well went get info on each of the folders on external hard drive are read only so changed that to read and write also system drive was read only changed that also no longer get pop ups for password to delete or authentification password to move folders . 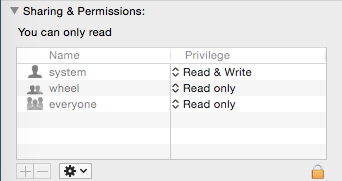 have i done the right thing with the system drive giving myself permission to read write ? I'm the only one who uses it btw. You should change those settings back and not mess with them. It is setup the way it is for system security to prevent rogue apps and malware etc from installing itself without you knowing it. You mean on the system drive ?. Back to read only ?. Well i put the system back for read only clicked apply before handbrake was finished and that wont run at all now .wont let me re install it again as i dont have enough space ive knackered somthing up what do i do now ?. Had to change permissions back on the system to allow me read and write again reinstall handbrake finish what was in the queue. How do i know if it will now be ok please ?. How to know? Reinstall from scratch. There's no way anyone here can know what you've done. Like Brian mentioned, without us knowing exactly what you changed, it is thought to know what to tell you to change to get things back to the default. I agree with Brian's idea to just command-r boot to recovery and reinstall to get things back to default settings. Backup first just to be safe, but this should not erase your data. Basically ive gave me the admin read and write permissions on the folders on the external drives so i can now move delete copy without any more requests for my admin password which im ok with . But on the machintosh hd system drive i gave my self the same read and write permissions this is the one im unsure i should have set or not whe i go to get info on the system drive my name now can read write permissions is this ok ?. Or should it read (read only) . I think because i performed this as handbrake was finishing i caused that problem to handbrake i have sine changed permissions deleted handbrake and reinstalled it works fine . But the system drive permissions are set at read and write fir me if its ok to leave it then fine thats all i need to know . i think when i get home from work i will use disc utilities to repair disc permissions on the drive after it has restarted ok i will then install yosmite as i have not done that yet and leave it alone lesson learnt. Right done internet recovery but not much changed however safari says could not download handbrake cause there is not eneogh space try deleting documents or diwnloading to anither location same with opera browser. Get info on machintosh hd sharing and permissions it has system wheel everyone but not me ?. Do a command-r boot to recovery and from there go to the Utilities menu and launch Terminal. Then enter resetpassword (all one word) and you will get this screen. Select Macintosh HD at the top then your user account in the dropdown. Leave the password fields blank since we don't want to change that. Now click that reset button. When it is done reboot and see if that helps things. Right did a quick google search and my home get info was set to read only so changed that to read and write im now able to download software again . In get info on the mac hard drive it has system read and write wheel read only everyone read only . This is how Macintosh HD is on mine and the default. You really should do that process I described to set the user folder permissions correctly. i see i need to reset acl's ! and what is terminal by the way a bit dos in windows ? 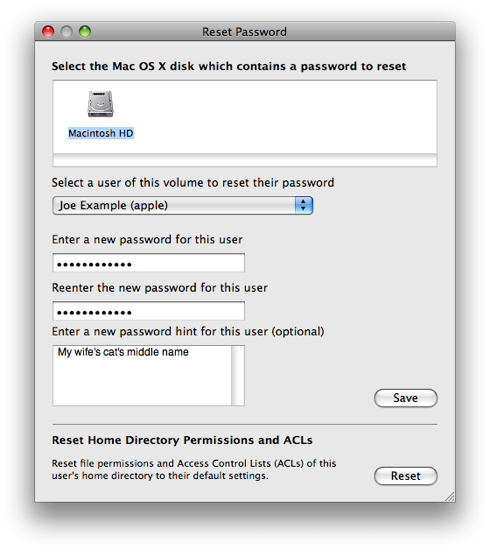 That process not only resets ACLs but will also set all the home folder permissions correctly, which is part of your problem. Terminal is a window that allows you to enter text commands very much like the old DOS command prompt yes. ok i will try that tomorrow at least my ac hard drive is set up and I've got that right. Yosemite should i then upgrade to that ?. It is up to you. Some like it and others don't like the new style. I have been pleased with Yosemite. Maybe take a look at the new features and see if anything there appeals to you. did all that last week but i have not beeb asked for password to delete stuff just the usual confirm delete. my home folder as me as read and write permissions just checking that my mac mini is set up as it should be and my homefolder permissions are indeed correct ?. Yes it would seem you have things set correctly now.